At a recent stamp show, I was sorting through a dealer’s box of postcards and came across several like the one shown in Figure 1 (front and back). Postmarked April 10, 1940, the card is a promotional piece for the Mailomat, a state-of-the-art, self-service, coin-operated postage meter machine for public use manufactured by the Pitney-Bowes Postage Meter Company. The device provided a single, streamlined operation of purchasing postage and mailing letters. 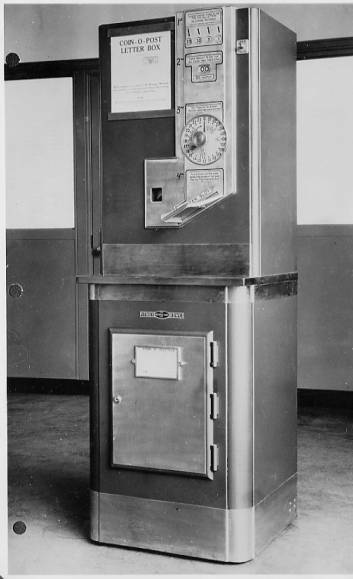 The customer dropped money into the coin slot, dialed the correct postage denomination (from 1c to 33c, including Air Mail and Special Delivery) and inserted the letter into the machine. The Mailomat printed on the letter or card a meter stamp containing the city name and date of the mailing and held the letter until it was collected by postal workers. 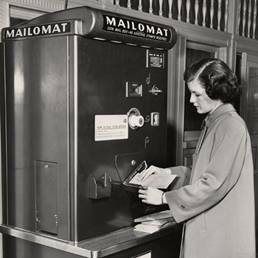 According to the National Postal Museum at the Smithsonian, the Mailomat was developed in cooperation with the U.S. Post Office Dept. and first placed into public service in New York City on May 17, 1939. Figure 2 shows an early prototype of the machine and Figure 3 is an image of the final design as made available in 1939. An interesting collection theme associated with the Mailomat promotional postcards are ones marked “First Day Cover,” such as the one in Figure 4 that I also acquired at the show and the first one I examined. Embracing what I have always considered to be the definition of a “first day cover,” I quickly pulled the card from the box to obtain a closer look at the upper right hand corner. However, there was not an adhesive stamp on the card. Instead, there was a one-cent meter marking with a “JACKSONVILLE / FLA. MAY-6’48” city/date. After all, even the American First Day Cover Society defines a First Day Cover as “an envelope or card bearing a stamp which is cancelled on the day the stamp is initially placed on sale by the postal authorities.” So, what did the "First Day" handstamp on these Mailomat cards really mean? I will gladly admit to some naiveté in what I discovered. 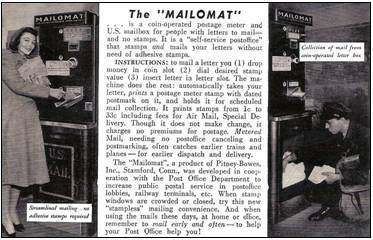 As mentioned, the first Mailomat was placed in public service in the United States in New York City on May 17, 1939. My Internet search revealed several of the New York City “First Day Covers,” such as the one shown in Figure 5. The key to solving my self-imposed mystery was the language in the left-side box of the cover explaining that the envelope was a limited edition prepared specifically for the installation ceremony of the Mailomat in New York City. 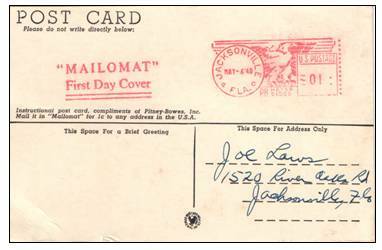 A “First Day Cover” marking on such mailings, therefore, commemorated the first day of the general public operation of the Mailomat in the particular city, such as May 6, 1948 for the Jacksonville, FL card I acquired. And, since the Mailomat was, in essence, a sophisticated metering device, there would never be an adhesive stamp affixed to the envelopes and cards, irrespective of a first day of issue consideration. 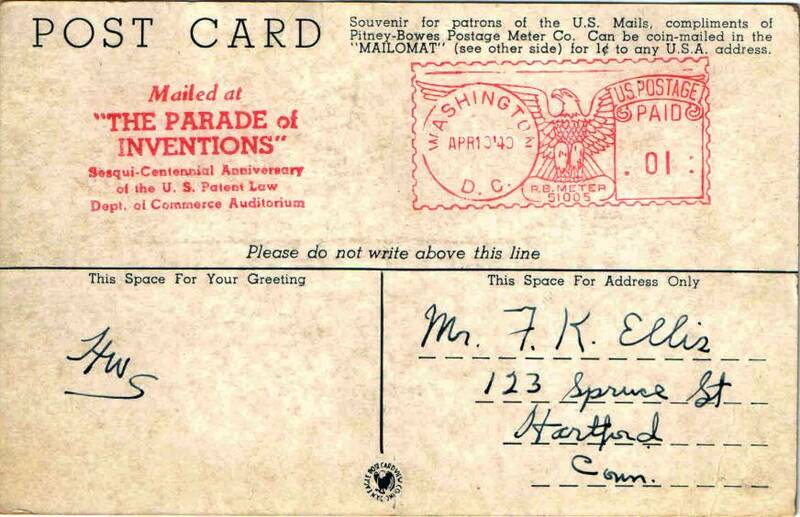 However, the use of the word “Cover” (instead of “Envelope”) in the description of the commemorative piece and the handstamp language applied to the Jacksonville postcard certainly suggests that someone did indeed know the philatelic use of that word. These commemorative pieces just may well have had a more philatelic motivation and purpose than first thought! At any rate, I now embrace a somewhat liberal definition of “first day cover” and willingly accept the fact that sometimes marketing objectives can take priority over philatelic terminology, such as with the promotion of the state-of-the-art Mailomat machine.